There is much more to sheer emptiness to a blank notebook. Our Monday got rejuvenated with exquisite stories as we sifted through the blank pages of our dear bloggers' notebooks. The posts that we got with this week's WOW prompt- "She opened a blank notebook" kept us glued to our seats as we lived myriad lives one by one through the creases of the blank pages, filled and spilled with virtual ink. Here's the epics that filled the notebooks, so flip the pages and here they are! Congratulations to all those who got featured in this space! Thank you for writing over the weekend. 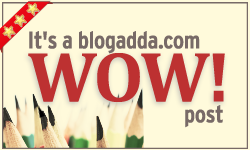 Here's a badge that you can proudly post on your blog!